Six Altmar-Parish-Williamstown Senior High School students have been selected to perform in the New York State School Music Association (NYSSMA) Zone 5 Area All-State Music Festival on November 16 and 17 at the Crane School of Music at SUNY Potsdam. Altmar-Parish-Williamstown Senior High School students selected to perform in the New York State School Music Association Zone 5 Area All-State Music Festival in November from left are: (Seated) T.J. Wilson, choir; Will Hall, choir; and Dylan Cowan, choir. ( Standing) Brian Wilson, band; Katie Palmer, band; and Shania Comtois, choir. Senior Brian Wilson will play the baritone and sophomore Katie Palmer will play the clarinet in the All-State Band while juniors Shania Comtois, Will Hall, T.J. Wilson and Dylan Cowan will perform with the All-State Choir. As part of this elite choral group, Shania will sing alto, Will will sing tenor, and T.J. and Dylan will sing bass. Participation and acceptance into Area All-State begins at the elementary level for many aspiring singers and musicians. At APW outstanding elementary students are selected for participation in all-county chorus and/or all-county band, something that also continues at the junior high school level. When the singers and musicians reach the senior high school level they work with music teachers to prepare a challenging solo to perform for a NYSSMA Certified All-State adjudicator. 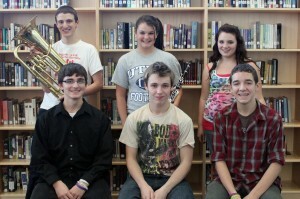 The students must score perfectly or nearly perfectly to be considered for area all-state. “Participation in this festival is an incredible honor. Our students have worked very hard and will join talented musicians from area schools such as Beaver River, Canton, General Brown, Gouverneur, Massena, Potsdam and St. Lawrence for the festival,” said APW Junior/Senior High School Music Teacher MaryAnn House.